An SSL Certificate or “SSL” for short, stands for Secure Sockets Layer. In simpler terms, it’s how online business communicate with customers that they can browse, buy products or services, and share information safely online. Without getting overly technical, adding an SSL creates a safe connection for those kinds of activities. 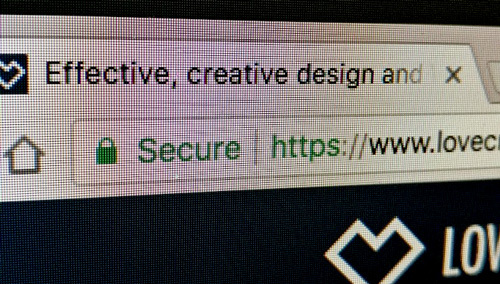 An SSL Certificate lets users know that your website is secure. Before dismissing your site as “too small to be a target,” bear in mind that most interceptions are done electronically without a human deciding who is being attacked. No site is too small to get hacked! A major reason you might want to add an SSL certificate to your website is if any of your pages are password protected. This includes the WordPress dashboard. The more users who have logins to your website creates more opportunities for black-hat hackers to attack. Google has recently been boosting the rank of websites that use SSL certificates (see this post from them on it for more info). A boosted SEO rank from Google can make your website appear higher up in search results as Google knows that your site is secure and trusted. Please let us know if you’d be interested in getting an SSL certificate added to your website to help with your SEO rank and we can give you a costing for it.